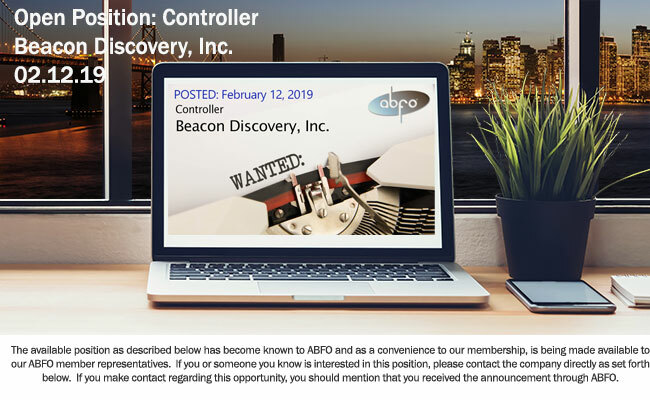 New ABFO Open Job Posting - Controller - Beacon Discovery, Inc.
Beacon is seeking a Corporate Controller located in San Diego, CA. ​This position is a hands-on leadership role that will be responsible for the accounting function, including financial close process, external financial reporting, accounts payable, payroll, stock plan administration, collaboration revenue, tax, accounting systems and direct management of audit engagements, cash management, budgeting and forecasting, amongst other responsibilities. Superior problem solving skills and ability to prioritize, organize and balance diverse tasks.